IAU circular No. 9127, issued on 2010, March 17, announces the discovery by J. V. Scotti of a new comet on Mar. 14, 2010, in the course of the Spacewatch survey. 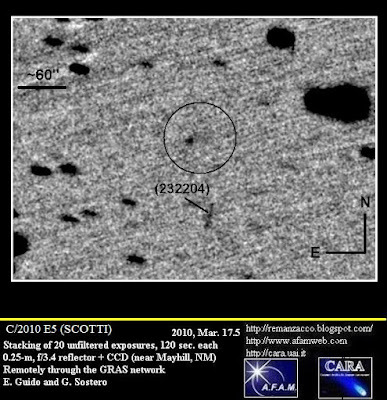 After posting on the Minor Planet Center's NEOCP webpage, many observers have noted the cometary appearance of this 19.5 magnitude object, designated C/2010 E5 (SCOTTI). We have been able to confirm this object remotely, through the GRAS network, using a scope located in Mayhill (NM): on 2010, March 17.4, co-adding of 20 unfiltered exposures, 120-seconds each obtained by means of a 0.25-m, f/3.4 reflector + CCD, show a coma nearly 10-arcsec in diameter, with a broad tail, about 25-arcsec long toward north-west. 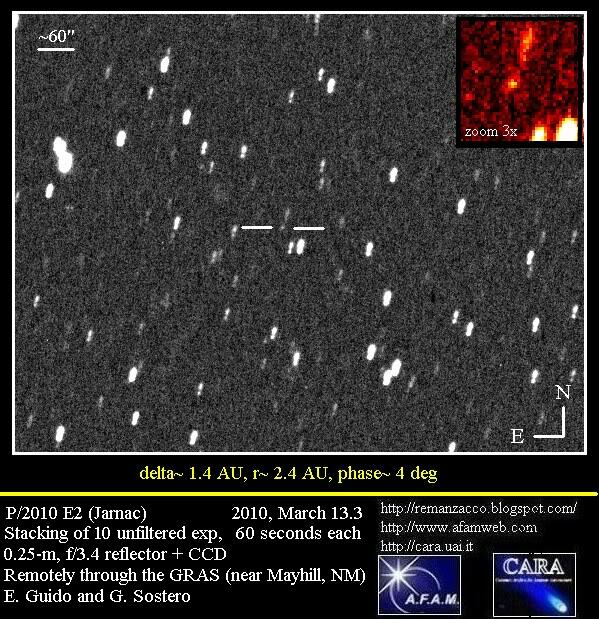 The first and preliminary orbit for comet C/2010 E5 (Scotti) indicates perihelion on Jan. 20, 2011, at about 4.0 AU. This is the 43rd comet for Spacewatch and the 5th for Scotti. IAU circular No. 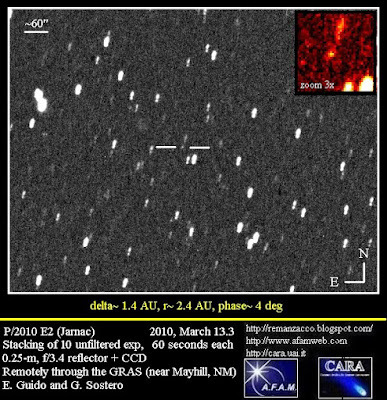 9124 issued on 2010, March 12, announces the discovery by G. J. Garradd of a comet on CCD images taken with the 0.5-m Uppsala Schmidt telescope in the course of the Siding Spring Survey. 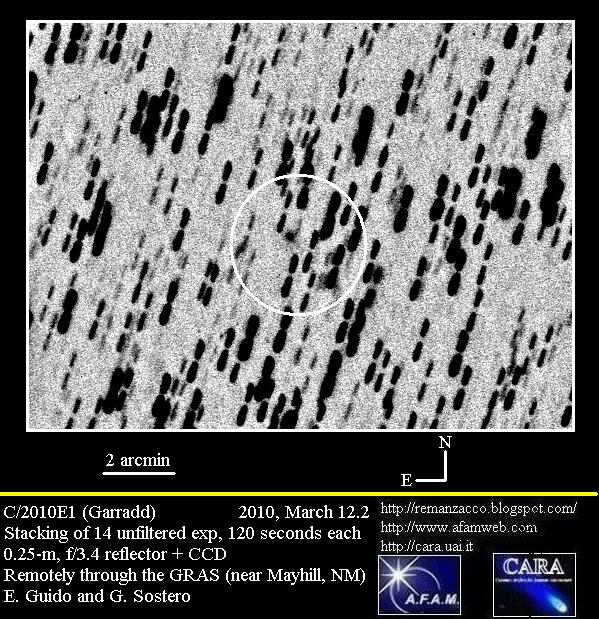 After posting on the Minor Planet Center's 'NEOCP' webpage, other observers have noted the cometary appearance of this 18.5 magnitude object, designated C/2010 E1 (GARRADD). We have been able to confirm this object remotely, through the GRAS network, using a scope located in Mayhill (NM): on 2010, March 12.2, co-adding of 15 unfiltered exposures, 120-seconds each obtained by means of a 0.25-m, f/3.4 reflector + CCD, show a diffuse coma nearly 10" in diameter with a a broad fan-tail about 20-arcsec long in PA 240-degrees. The first and preliminary orbit for comet C/2010 E1 (Garradd) indicates perihelion already on Oct. 24, 2009, at about 2.6 AU. According to COCD webpage this is the 15th comet for Garradd, and the 68th comet for the Siding Spring Survey. IAU circular No. 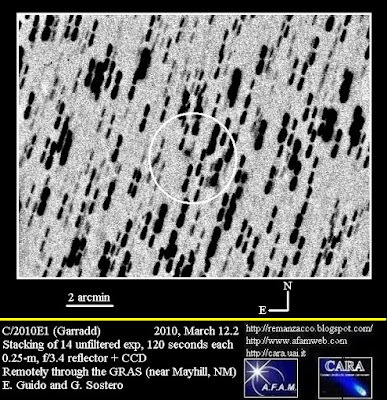 9125 issued on 2010, March 13, announces that an apparently asteroidal object reported by T. Glinos on CCD images taken with a 0.64-m f/7.2 Ritchey-Chretien telescope at the Jarnac Observatory (observers listed as D. Levy, W. Levy, and T. Glinos) has been found to show cometary appearance by other CCD astrometrists. Moreover the MPC was also able to link observations of the Mt. 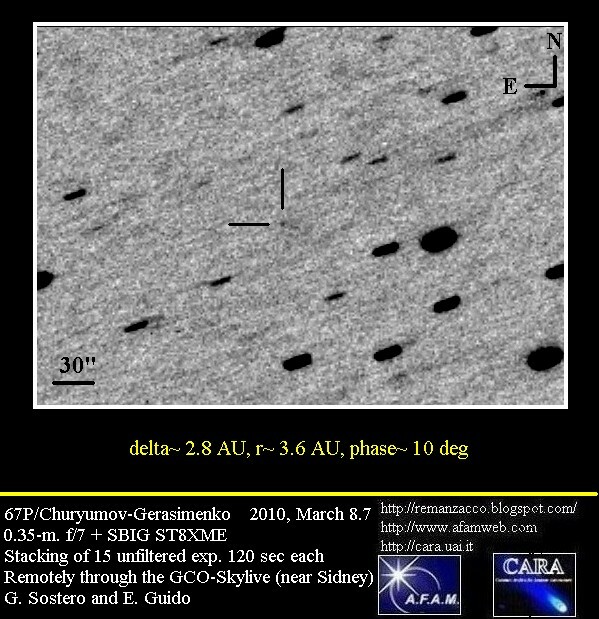 Lemmon Survey obtained on Feb. 17, 2010. This is the first amateur discovery in 2010!! A new bright sungrazing comet has been discovered in the images of SOHO spacecraft. The comet is probably a member of the Kreutz sungrazer family and probably will not survive this close encounter with the Sun. Anyway as expected, these sungrazing comets have not survived the close encounter with the sun. 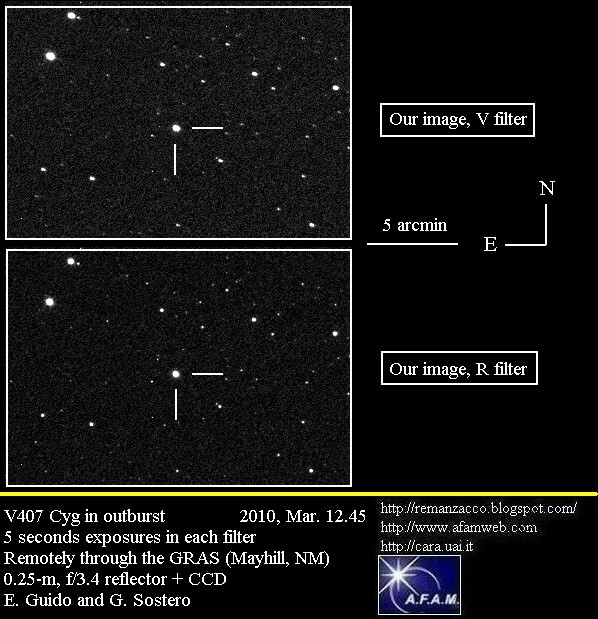 According to Cbet No.2199 issued on March 11, 2010, the symbiotic star V407 Cyg is undergoing an apparent unusually bright outburst (mag 7.4). The outburst has been detected by Koichi Nishiyama (Fukuoka, Japan) and Fujio Kabashima (Saga, Japan) by means an unfiltered CCD image taken on Mar. 10.797 UT using a105-mm camera lens + CCD. (independent discovery of this outburst by Tadashi Kojima). We performed some follow-up of this outburst, remotely with a 0.25-m, f/4.3 reflector + CCD + Johnson V and Cousins R filters. On 2010 March 12.45, we measured Vj= 8.2 and Rc= 7.2 (accuracy about 0.1 magnitude in each band). Here you can see a gif animation showing a comparison between one of our images of V407 Cyg Outburst and an archive DSS plate. Our image is a 60sec exposure, unfiltered obtained on March 12, 2010. The DSS is an image of 11 September 1990 (R Filter). The usual V407 Cyg observed range is magnitude 13 to fainter than 17; it may have been a slow nova in 1936, and a Mira-type variable appears involved with this object, as well. This brightening is well outside its previously stated range and may indicate a nova outburst in progress. According to the AAVSO: "Suggested classifications for this source include slow nova with either a Mira secondary or Mira component, or a symbiotic star. Spectroscopy and multicolor photometry may provide more information on the nature of this system, while visual observations and time-series photometry will be needed for tracking the overall light evolution of the system"
Spectroscopic observations are urgently required. Spectra indicates that the object is indeed undergoing a nova outburst, in a symbiotic environment!! A scenario reminiscent of the symbiotic recurrent nova RS Oph. According to Cbet 2204, U. Munari et al. 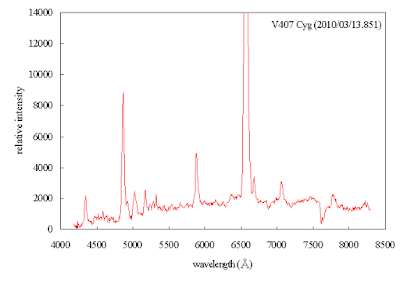 (INAF-ANS coolaboration) report that they obtained absolutely fluxed, low-resolution spectra of V407 Cyg. The spectral appearance is a highly peculiar one. The spectrum is completely different from those ever recorded for this object and other symbiotic Mira variables in outburst. The white dwarf companion to the Mira variable is experiencing an outburst similar to that of classical novae, and its ejecta are moving in the circumstellar environment already filled by the ionized wind of the Mira. Periodic comet 67P/Churyumov-Gerasimenko, has greatly attracted the attention of the astronomical community, after the re-scheduling of the European Space Agency "Rosetta" mission toward it (http://www.esa.int/esaMI/Rosetta ). After its perihelion passage, on February 28th, 2009, comet 67P has decreased its brightness, and moved toward solar conjunction. Currently it's observable again in Virgo. The main difficulty is due to its faintness (according to the ephemerids it's about m1= 19). 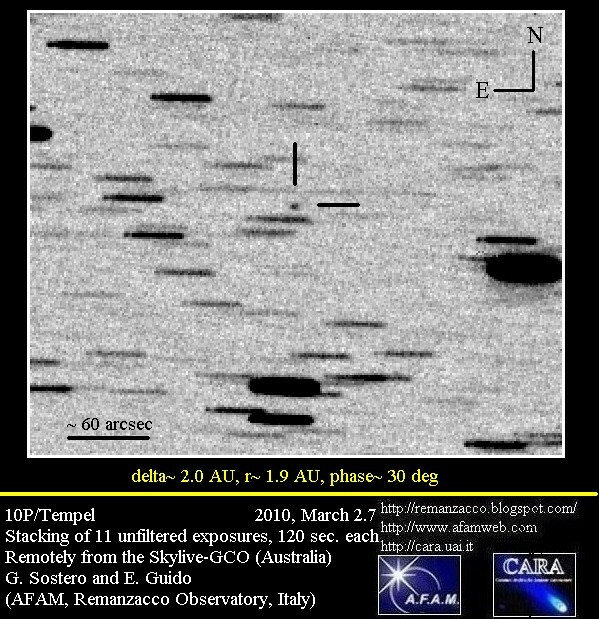 On 2010 March 8th, we tried to perform some follow-up about this comet through the Grove Creek Observatory-Skylive network (near Trunkey, Australia). The sky conditions were good (stellar FWHM about 1.5 arcsec), with a stellar limiting magnitude on the final stacking close to 21. 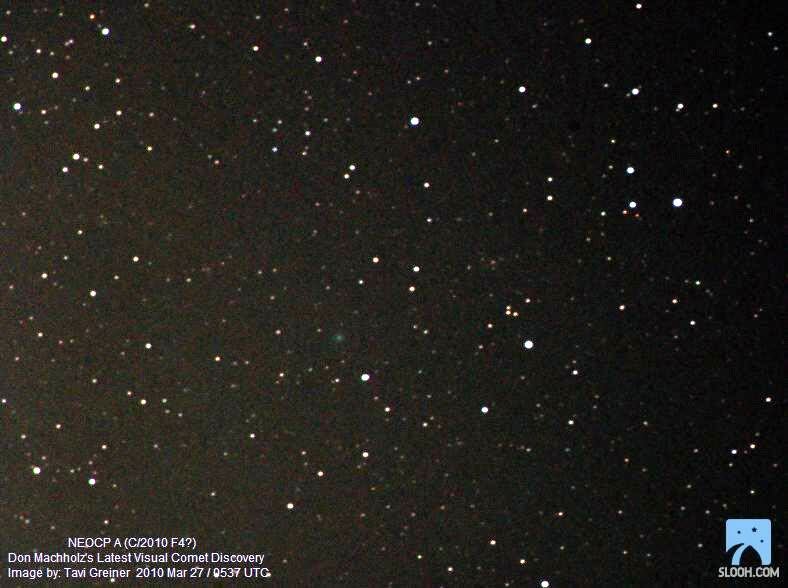 According to the IAU-Minor Planet Center, "Dates Of Last Observation Of Comets", it was last observed on 2009 June 26, by the Observatorio Nazaret, of G. Muler (MPC#J47, Lanzarote, Spain). Goodbye 67P, looking forward to you in May 2014, time of arrival of the Rosetta probe in yours vicinity. A bright fireball has been seen over Hungary aroud 23:24 local time (22:24 UT) of February 28, 2010. The meteor was spotted from Slovakia and Southern Poland too. Many surveillance cameras have recorded the night-landscape illuminated by the fireball. We measured it at (unfiltered Red) magnitude nearly 18, with a tiny coma of about 15 arcsec in diameter. Image enhancement techniques didn't provide any appreciable extent to the measured coma. One possibility is that, like other short period comets, 10P will develope an appreciable coma when it will get closer to the Sun (currently it's beyond the orbit of Mars, at about 2 AU from our star). Obviously we cannot rule out the hypothesis that the moonlight disturbance and/or the low altitude of the object on the horizon might have compromised the detection of a faint external coma (in spite of the fact that the sky was pretty clear and transparent). 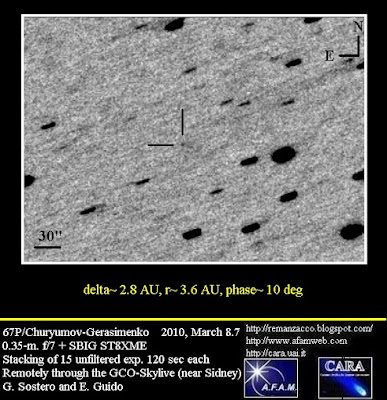 The Afrho parameter (proxy of the dust abondance within the coma) currently is about 15 to 20 cm, like other short period comets at this distance, prior to their perihelion. Finger crossed for a neat binocular comet next summer.